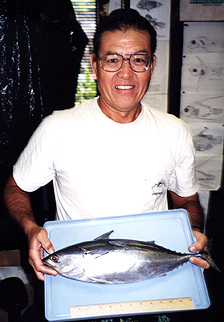 Edward Narimasu scored the state record frigate mackerel while on a trolling trip outside Wai'anae on the island of O'ahu. He was trolling the Maili Ledge in 260 feet of water when the 3-lb 11.52-oz fish ate a 4-inch chrome head skirted blue/silver/pink. Ed angled the fish using a Shimano TLD 50 loaded with 50-lb test Momoi monofilament. Bullet tuna are uncommon in Hawaii and difficult to identify by fishermen. This one was recognized by ichthyologist Dr. Jack Randall.